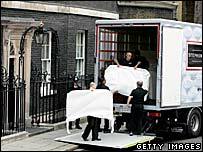 I wonder whether the 15 mins gap is to allow the Prime Ministerial limo to be valeted? Of more interest though is an article from Spiked on 10 reasons why Brown isn’t fit to be Prime Minister – it’s a sobering list to recall amidst the hype, the promises, the government of ‘all the talents’. This is a man who’s taken a full part in government for the last decade; complicit at least with all of the decisions and wielding unprecedented power over domestic politics. It’s going to take more than a spray of Teflon Makeover Juice to make Iraq, pensions, habeus corpus, smoking bans, higher taxes and the general smog of “miserabilism” fade from the front of our minds – especially for those who believed in the new start and opportunities presented in the post-Thatcher era (if indeed we are yet Post-Thatcher…). At the Innovation Reading Circle last night I heard Andy Keen vent some anti-Web2.0 spleen and it made me wonder whether we’re about to see some anti-Labour2.0 outpourings. That’s if anyone can get over their apathy and disappointment to care enough to rant. House of Fraser, the only nationwide UK destination department store for premium brands and designers, is imminently to revise its eCommerce activities with a major new transactional website, built on a best-of-breed platform. This site will be the UK’s “house of brands” and a premium shopping destination. We are now seeking ambitious, commercial and dynamic people to play an integral part in the launch and rapid further development of this significant online retail initiative. These roles sit at the commercial heart of the business and form the vanguard in delivering the ambitious growth targets to which the Board is fully committed. By joining House of Fraser now you will have a career-defining opportunity to create a highly visible, class-leading operation – at a time of growth at House of Fraser and within the eCommerce industry. In addition to the Head of eCommerce role, we’re also seeking an eCommerce Manager (the senior online merchandising role) and an eCommerce Marketing Manager (to own the customer experience and ensure that acquisition, conversion and retention activities are optimised). Here’s another House of Fraser role: Head of Operations for the eCommerce team. This is just a stunning job: you’ll have all of the reins for the service components in your hands: technical architecture, contact centres, logistics, warehousing, application support… Sigh: a job for a serious, commercial operator who’d relish this career-defining opportunity to create and then ruthlessly develop a stand-out web business. The ambition is nothing less than to lead the UK’s retail sector: since you’ll know our competition you will not take that ambition lightly. Applications etc should be as set out in the advert and Ann Jamieson is handling responses and aiding selection. However, if you want to get the inside track or have any questions please feel free to contact me. I have been working for the last few months with House of Fraser, the UK’s destination department store for premium brands and designers, to launch their multichannel capability with a major web launch. To borrow an American phrase, the ‘rubber’s about to hit the road’ and HOF is now recruiting the key members of the team. * Combining creative flair with ruthless procedural approaches and deep analytical rigour, you will at once create sparkling copy owning the linguistic tone of our brand online while setting standards for others to follow while continually experimenting with, and optimising, our copy to maximise profit. * This is not a role for a ‘woolly creative’ or poet aspirant. Rather, it’s for a cunning, rigorous wordsmith who will charm the money willingly from our customers, delight our prestige suppliers with the presentation of their products, tweak AdWords and page copy to outperform our competitors’ conversion rates and whose curiosity and excitement with the commercial impact of aweinspiring prose is undimmed. * Needless to say, you will have a comfortable fluency and you will not wear your grammatical precision in too stuffy a manner. You can see the full details on e-consultancy’s job board. So let me get this right: an out of touch Tory Lord and a septuagenarian once-trendy designer have come up with a logo that, erm, is to connect with and inspire the Yoot of da YooKay. Compared to some of the previous olympic logos – nicely set out on this site – you really realise that the whole ‘cool brittania’ stuff was vapid patronising star-struck nonsense. This is the visual equivalent of seeing a cardigan-wearing geography teacher letting rip on the floor of a school disco. I wonder whether I’ll get to like this logo any more when the increased council tax bills start landing? DPReview has a link to the new guidelines for the “Specification Guideline for Digital Cameras”. Currently in draft the document carries the collaborative weight of Nikon, Canon, Pentax, Panasonic, Sony and others. Currently the only topic on digicams is the infernal megapixel level – an annoying and largely irrelevant metric when the camera has high noise, terrible compression algorithms and a shutter lag measured in geological time! Standards – to ease comparison and make key features visible – are always a good thing and it’s cheering to see an industry body taking the initiative here. What a line-up of interesting, small exhibitions and shows, all taking place in NYC for the 60th anniversary of the Magnum Photo agency. Now, how can I arrange a ‘vital business trip’ to NYC this month… ? ?